For the third time in six years Australia’s most popular exhibition has been transplanted to the coast of Jutland, drawing enormous crowds. 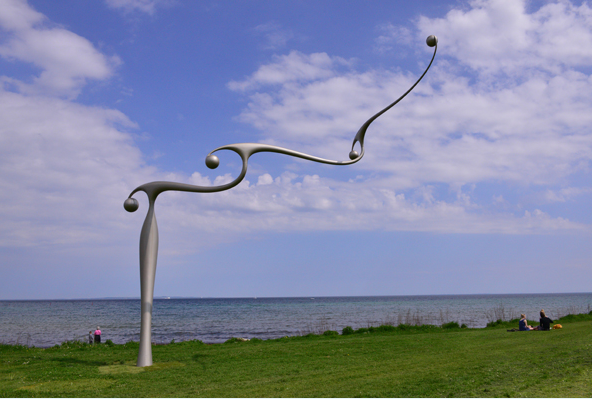 Sculpture by the Sea first came to Denmark’s second city, Aarhus, in 2009, at the behest of Crown Prince Frederik and his Australian bride, Crown Princess Mary. Had the Danish Royal Family been less popular and influential it might never have happened because staging this show in Europe is a fearsome logistical exercise. It would have been more expedient to dump the original proposal in the too-hard basket, and presume that nobody would want to see a show of sculptures lined up on the sea-shore. Yet any initial skepticism was dispelled by attendance figures that saw more than 500,000 people visit the inaugural show over the course of a month. That result was repeated in 2011 and this year the event is on track for another big turn-out. Arriving in Aarhus on a Sunday the grassy promenade between the park at Tangkrogen and the foreshore at Ballehage looked like a crowd scene by Cecil B. DeMille. This year, for the first time, the Danes have really taken ownership of the exhibition. 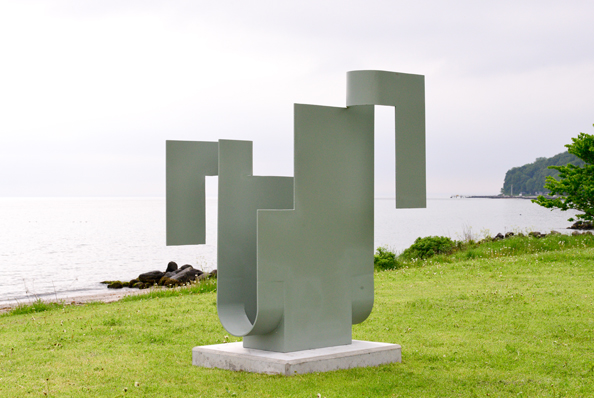 In 2009 there were 27 artists from Australia and 19 from Denmark in a show of 60 works. The current exhibition of 65 works features 15 Australians and 22 Danes. The next highest national representation comes from Germany and the Netherlands with three artists each. In addition there are pieces by sculptors from Canada, China, England, Poland, New Zealand, Argentina, Sweden, the United States, South Korea, Spain, Austria, Iran, India, Norway, Finland and Singapore. If Australia is eclipsed at last, the other diminished nation is Japan, represented by only one artist, Zero Higashida, with a shiny, metal abstraction based on the Louvre’s Victory of Samothrace. The Japanese sculptors have been mainstays of the Australian versions of Sculpture by the Sea almost from the beginning, and it is feels strange thar they are missing. 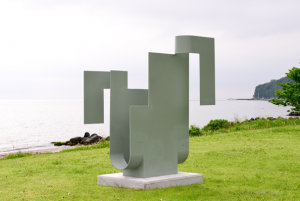 The Australians have long joked among themselves that when the Danes saw a sculpture proposal they would ask: “But what does it do?” This acknowledges that the attitudes of Danish artists and curators are more contemporary than those of their Australian counterparts. They generally feel the show should be edgy and experimental, whereas the Australians favour a broad range of approaches. 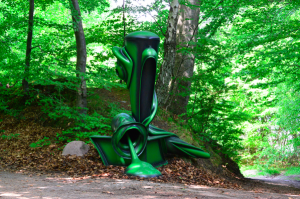 There is a commercial imperative in taking a more inclusive line as people are happy to buy sculptures that sit quietly on a shelf or a block of land, but less interested in acquiring videos, large-scale installations and sound works. In this year’s show there is a preponderance of less commercially-viable pieces, including an audio work called The Forest Organ by Birgitte Kristensen and Soren Lyngso Knudsen, which transmits sounds through speakers attached to trees in a clearing. One hesitates to call it music, but it is no more noise-like than many compositions by the Darmstadt composers. Similar in presentation but more dramatic in content is Forest (for a thousand years), by the Canadian duo, Janet Cardiff and George Bures Miller. In the midst of another clearing we listen to planes flying overhead, gunfire, explosions and the furious beat of horses’ hooves. This barrage is replaced by singers intoning the high, ethereal sounds one associates with the music of the Middle Ages. The effect is uncannily clear and realistic. 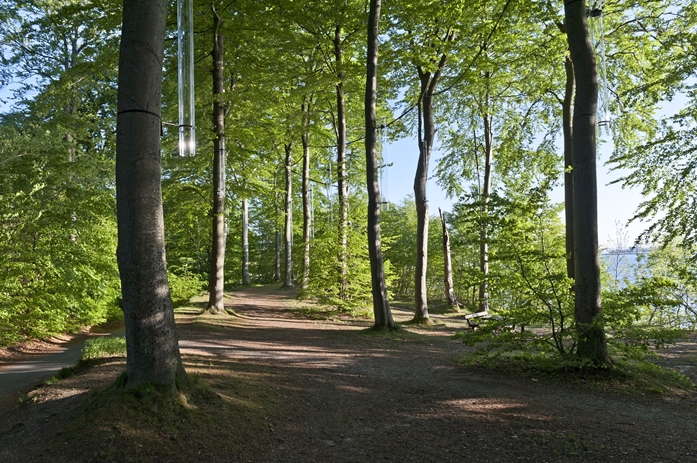 The Forest of Marselisborg, where these sound installations are located, is the most striking environment in the Aarhus exhibition. Neither Bondi nor Cottelsoe allow artists an opportunity to display their work in an enclosed space surrounded by tall trees and greenery. 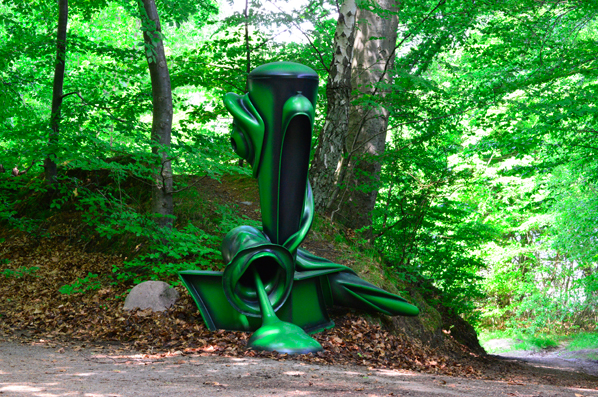 Only a few Australian sculptors have taken advantage of this setting, including Angus Adameitis, who has contributed an impressive biomorphic, green metal sculpture called Arion Vulgaris, and Marcus Tatton, who has stacked a wheelbarrow with a tower of wooden blocks, in a piece called Prodigious. (My erudite friend, John Hislop, has just reminded me of William Carlos Williams’s lines: “so much depends upon /a red wheelbarrow.. “). 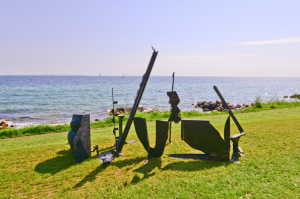 Both Adameitis and Tatton are seasoned participants in Sculpture by the Sea, as are artists such as Paul Selwood and Orest Keywan, who are represented with evocative, abstract sculptures. Although Keywan has included a recognisable face this acts like a fragment of some classical ruin. It is iconic rather than realistic. The largest, heaviest forest installation is by Sasha Reid, who has created a field of fallen tree trunks called Immovable Object, Unstoppable Force. At first glance the piece looks like the aftermath of some natural disaster, but the trunks are cut and arranged in an orderly manner that suggests the unstoppable force of the title was human in origin. The sole collaborative work between Australian and Danish artists is The Garden of Natural Delights (After Bosch), by Bjorn Godwin and Jette Gejl. 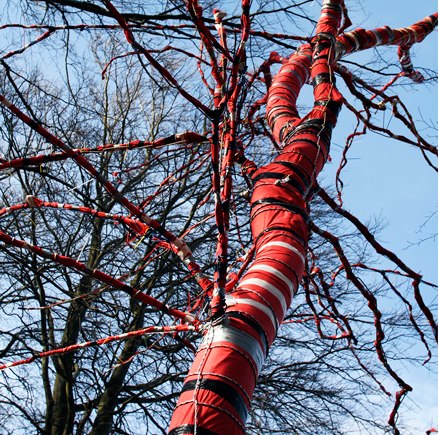 A living tree has been mummified in coloured strips of cotton, forcing new twigs and leaves to squeeze their way out into the light. The effect probably owes more to Christo than to Hieronymus Bosch. If you think this sounds hard on the tree it had already been singled out for removal before the artists set to work on it. As usual, a certain percentage of works in this show may be characterised as gimmicks, such as a floating message-in-a-bottle by Vibeke Norgaard Ronsbo; a mannequin in a suit perched high in a tree, by Susanna Hesselberg; and a little house with a big TV antenna, by the Danish couple, Randi and Katrine, which makes one think of the wicked witch’s ginger bread cottage. A floating sauna by the architects, Rintala Eggertsson, is a similarly quirky addition, but it seems appropriate for a Scandinavian setting. 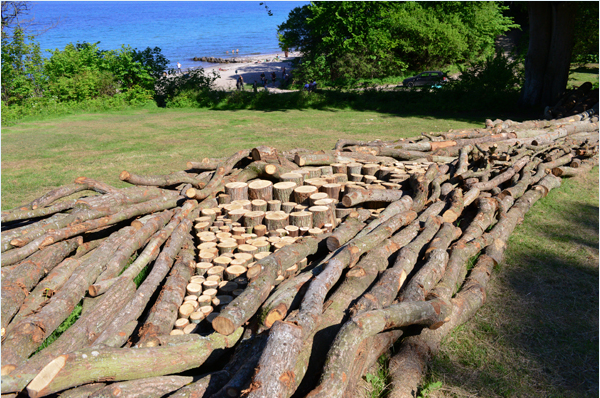 A work that is saved by its sheer scale is Gary Deirmendjian’s Strata-Tangkrogen – a 10 X 15 metre hole in the ground, filled with rubbish sourced locally in Aarhus. It seems remarkable that the authorities would let Deirmendjian dig up such a huge piece of earth, even if piles of dirt and rolls of turf stand ready to repair the wound at the conclusion of the show. He would be unlikely to get away with it in Mark’s Park at Bondi, which may only reaffirm that the Danes are more artistically adventurous than the Aussies. No matter how daring a sculpture may be in theory it needs to be executed and installed with a high degree of professionalism, and a little luck. Nina Saunders’s work, appropriately named Heartbreaker, was meant to be a golden bathing jetty, shimmering like a mirage in the sunlight. Instead, it is a sad-looking object that seems to have been denuded of paint. A worse fate was in store for Michael Shaw’s INF18, intended as a vast, inflatable serpent, wrapping itself around a Royal summer palace nestled in the forest. A burst of wild weather at the beginning of the show left this piece in a ruinous state, requiring its removal. By coincidence this happened shortly after Florentijn Hofman’s Rubber Duck deflated in Hong Kong Harbour, leaving a flat yellow disc bobbing on the water, like a fried egg with a broken yolk. If you’ll pardon the expression, such accidents may help take the wind out of the burgeoning fad for inflatable art that is sweeping the world. We tend to think of sculpture as something strong and durable, but one little pinprick can bring down the most monumental blow-up. Inflatable art seems so incurably tacky it may never be anything more than an attention-grabbing stunt that makes an instant impression on audiences but provides little food for thought. Even if a work of art can’t always be profound, it should at least have an intrinsic sense of form that invites our admiration. 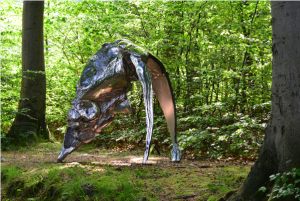 I’ve yet to see an overgrown beach-ball with one iota of the elegance of a kinetic sculpture by New Zealander, Phil Price, whose Snake is a highlight of the Aarhus exhibition. It is a work that is constantly in motion, set dancing in space by the merest hint of a breeze. In a catalogue statement, Jens Erik Sorenson, the director of Aarhus’s cutting-edge local art museum, Aros, praises the number of works in this year’s show “that stretch and challenge the very concept of sculptures.” It might be argued, however, that this ‘concept’ was challenged and overcome many years ago, during the heyday of Conceptual Art. It has been a long time since we believed that a sculpture was defined by its three-dimensionality, but like all lost illusions it remains an appealing idea. The current incarnation of Sculpture by the Sea succeeds in spite of its newfound radicality. 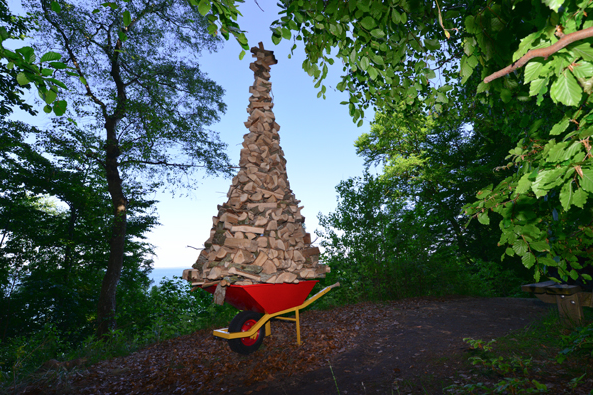 It succeeds through its variety, through skillful placements in the landscape, and the fact that it gives a few hundred thousand people a good excuse to come down to the Baltic coast on a pristine summer’s day.